BendPak super-duty two post automotive lift models are designed for the most demanding use, and offer the greatest features to make your shop more productive, all while providing you with years of trouble free service. Featuring heavy duty steel construction, along with design features to provide convenience and the ultimate in safety. You'll see why BendPak lifts are right for your busy auto shop. 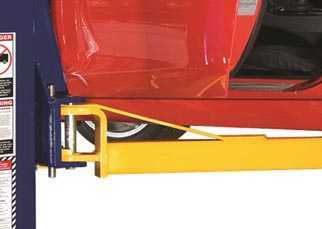 The BendPak XPR-12C car lift is ALI and ETL Certified. It's all about increasing profits and saving time. Take a look and you'll see what we mean. Every heavy duty truck lift includes frame cradle pad adapters that grab the frame and keep it from slipping off. This handy feature is not found on competitor models. Built durable and tough, the XPR heavy truck series not only have the strength to handle the toughest jobs, but also is well suited to raise passenger cars, light trucks and autos. So don't worry, we've got you covered. It has pads that are lower than most truck lifts, and the arms are able to reach even narrow automobiles as well. They also configured the columns to be father apart, which allows for greater drive through clearance, which comes in handly for the mirrors on those wider trucks. Plus, the columns are nice and tall, allowing you to raise taller service box trucks and vans without tripping the shut-off bar prematurely. Don't forget about the three stage arms on all 12,000 lb. models. These allow you to reach the frame jacking points that you couldn't dream about getting at with the standard two stage arms that most lifts have. The BendPak XPR-12C 2-post car lift is engineered for professional auto shops who are serious about their equipment. It is comprised of features to make is safer, more reliable and more durable than the competition for every application. They also made it more efficient, to increase your shop's productivity and reduce expenses and maintenance as you'll see if you continue scrolling down below. If you want a premium heavy duty automobile and truck lift at a reasonable price, the XPR lifts are for you.